Rapid advances in light microscopy have revolutionized our ability to study biological systems at the microscopic level. New physical instrumentation, chemical innovations and biological discoveries are constantly emerging. The central goal of our research group is to discover novel principles of optical imaging by exploring the interface between physics, chemistry, chemical biology, engineering and data science, and then apply these advanced technologies to address important areas in life sciences such as brain imaging, tumor metabolism and metabolic diseases. Meanwhile, we are also pushing these powerful technology into industrial, medical and clinical applications. Chemical bonds are inherent targets for optical spectroscopy, offering power spectroscopic contrast for chemical imaging. Stimulated Raman scattering (SRS) microscopy has emerged as a highly sensitive and specific vibrational imaging technique. 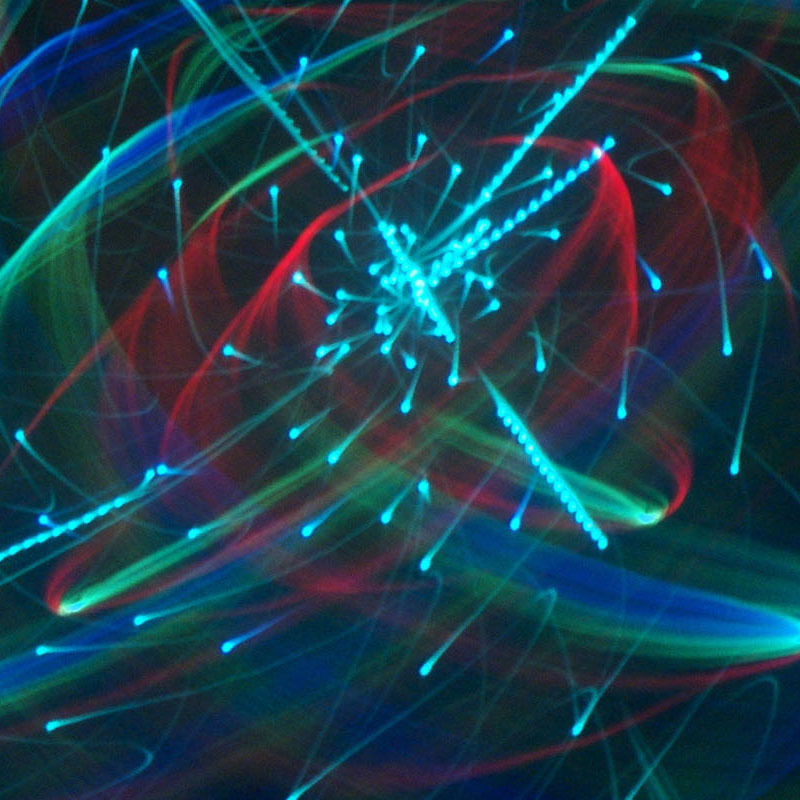 When the energy gap between two lasers (pump beam and Stokes beam) is resonant with the vibrational level of targeted chemical bonds, the joint action of the pump and Stokes fields stimulates (i.e., accelerates) the otherwise slow vibrational transition by 108 times. Spectroscopically, the SRS spectrum is identical to that of spontaneous Raman without the complication of nonresonant background, thus offering straightforward and robust spectral interpretations. The detection sensitivity of SRS is several orders of magnitude more sensitive than the conventional Raman microscopy. As a result, video rate SRS imaging is feasible. In addition, SRS signals are linearly dependent on analyte concentrations, allowing for quantitative analysis. Moreover, the nonlinear nature and the adoption of near-infrared laser wavelengths allow SRS three-dimensional optical sectioning into deep tissues. After raster-scanning across the sample, one can produce a three-dimensional concentration map of the targeted chemical bonds in biological samples. C. W. Freudiger*, W. Min*, B. G. Saar, S. Lu, G. R. Holtom, C. He, J. C. Tsai, J. X. Kang and X. S. Xie. “Label-free biomedical imaging with high sensitivity by stimulated Raman scattering microscopy”, Science, 322, 1857, (2008). W. Min*, S. Lu*, S. Chong, R. Rahul, G. H. Holtom and X. S. Xie. “Imaging chromophores with undetectable fluorescence by simulated emission microscopy”, Nature, 461, 1105, (2009). W. Min, C. W. Freudiger, S. Lu and X. S. Xie. "Coherent nonlinear optical imaging: Beyond fluorescence microscopy", Annu. Rev. Phys. Chem., 62, 506, (2011). High detection sensitivity and fine chemical selectivity are of pivotal importance for microscopy. While fluorescence microscopy offers superb sensitivity, it is limited by its relatively poor selectivity. We recently reported electronic pre-resonance stimulated Raman scattering (SRS) microscopy by combining the superb sensitivity of electronic spectroscopy and chemical specificity of vibrational spectroscopy. In contrast, all the previous SRS microscopy is operated in the “non-resonance” region, in which the energy of the pump laser (ωpump) is well-below that of molecular absorption energy (ω0). We identified an electronic pre-resonance SRS (epr-SRS) regime which represents an exquisite balance between signal enhancement and background suppression. In epr-SRS excitation, the energy of the pump laser (ωpump) is chosen to be close to but slightly lower than that of molecular absorption energy (ω0). The resulting epr-SRS microscopy has demonstrated detection sensitivity down to nano-molar concentration (about 1000 times higher than previous nonresonant SRS) with retained narrowband vibrational contrast for imaging and essentially no electronic background and little photo-bleaching. L. Wei, Z. Chen, L. Shi, R. Long, A. V. Anzalone, L. Zhang, F. Hu, R. Yuste, V. W. Cornish and W. Min. “Super-multiplex vibrational imaging”, Nature, 544, 465 (2017). Modern science and technology have exploding demands for multiplexing techniques to simultaneously measure a large number of distinctive species. Notable scientific research areas include exploring structure–function relationships in brain, in situ RNA profiling for spatial transcriptome; understanding heterogeneity of tumor microenvironments; revealing intricate organelle interactions of living cells. Meanwhile, multiplexing biotechnology applications include cell phenotyping, sorting and tracing, high-throughput detection of antigens for diagnostics, and high-throughput screening for drug discovery. All these multiplexing-central areas are beyond the reach of fluorescence microscopy. Therefore, transformative imaging technology is urgently needed to overcome the spectral limitation and break this longstanding “color barrier”. Recently we conceived a novel optical super-multiplex imaging platform. Our invention consist of two components: (1) introducing a new paradigm of coherent Raman microscopy; (2) creating a matching palette of imaging probes with sharp (~15 cm-1) Raman peaks. Physically, we have developed electronic pre-resonance stimulated Raman scattering (epr-SRS) microscopy, achieving sensitivity down to several tens of molecules while retaining exquisite vibrational selectivity. Hence, epr-SRS microscopy can be complementary to or even supersede fluorescence in multiplex applications. 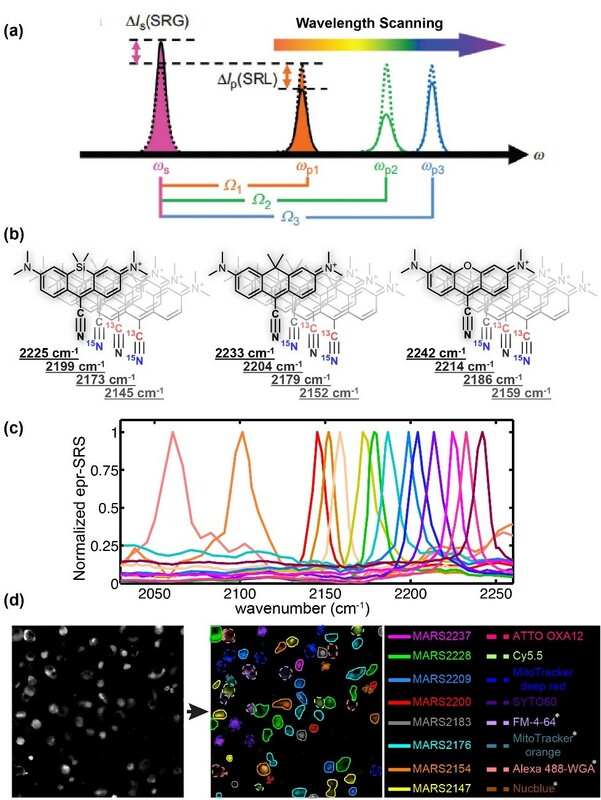 Chemically, we have designed and synthesized a new palette of Raman probes (named MARS dyes) that enabled simultaneous 24-color imaging with potential for expansion. MARS dyes exhibit 100 times sharper Raman peaks than fluorescence spectra. Biologically, we demonstrated its utility in various cells and tissues, monitored proteome turnover dynamics, and discovered metabolic heterogeneity between neuron and astrocytes. It is extremely desirable to be able to probe biological activities deep inside living organisms. Utilizing a nonlinear excitation scheme, two-photon fluorescence is the most successful optical microscopy for this endeavor. 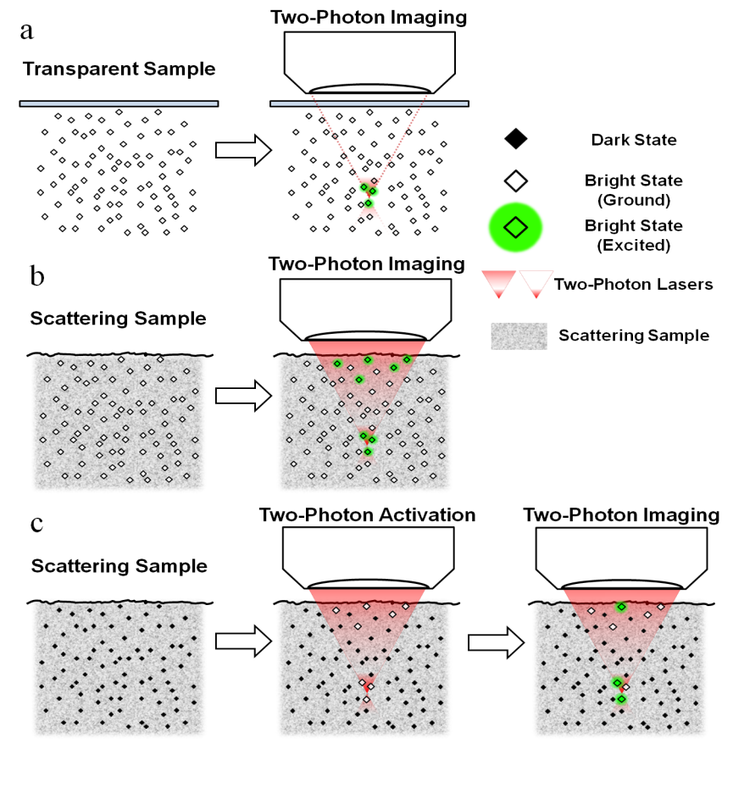 However, a fundamental imaging depth limit still exists for two-photon fluorescence microscopy when imaging highly scattering samples, accompanied by the inevitable background excitation. Essentially, the optical sectioning picture breaks down when approaching the fundamental depth limit. Quantitatively, the depth where the in-focus signal and the out-of-focus background are equal to each other is defined as the fundamental imaging-depth limit. We are interested in breaking and extending such a fundamental imaging-depth limit for ultra-deep tissue imaging. We reason that higher order nonlinear processes should offer even tighter spatial localization of the fluorescence generation and potentially deeper penetration. To this end, we have conceived and realized a family of super-nonlinear fluorescence microscopy rendered by spectroscopic transitions including photoactivation, photoswitching, stimulated emission, ground state depletion and frustrated FRET. Conceptually, unlike conventional multiphoton processes mediated by transient virtual states, our strategy constitutes a new class of fluorescence microscopy where high-order nonlinearity is mediated by real population transfer. 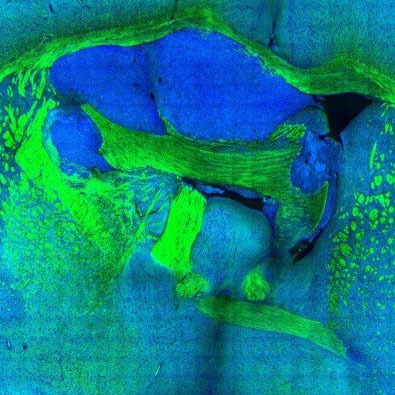 Practically, this class of super-nonlinear fluorescence microscopy has the prospect to image scattering samples such as brain tissues with unprecedented contrast and depth penetration. Y.-T. Kao, X. Zhu, F. Xu and W. Min. “Focal switching of photochromic fluorescent proteins enables multiphoton microscopy with superior image contrast”, Biomed. Opt. Express 3, 1955 (2012). Z. Chen, L. Wei, X. Zhu and W. Min. “Extending the fundamental imaging-depth limit of multi-photon microscopy by imaging with photo-activatable fluorophores”, Opt. Express 20, 18525 (2012). X. Zhu, Y.-T. Kao and W. Min. “Molecular-switch-mediated multiphoton fluorescence microscopy with high-order nonlinearity”, J. Phys. Chem. Lett. 3, 2082 (2012). L. Wei, Z. Chen and W. Min. “Stimulated emission reduced fluorescence microscopy: a concept for extending the fundamental depth limit of two-photon fluorescence imaging”, Biomed. Opt. Express 3, 1465 (2012). Innovations in light microscopy have tremendously revolutionized the way researchers study biological systems with subcellular resolution. In particular, fluorescence microscopy with the expanding choices of fluorescent probes has provided a comprehensive toolkit to tag and visualize various molecules of interest with exquisite specificity and high sensitivity. Although fluorescence microscopy is currently the method of choice for cellular imaging, it faces fundamental limitations for studying the vast number of small biomolecules. This is because common fluorescent labels, which are relatively bulky, could introduce considerable perturbation to or even completely alter the native functions of vital small biomolecules. Hence, despite their immense functional importance, these small biomolecules remain largely undetectable by fluorescence microscopy. To address this challenge, a bioorthogonal chemical imaging platform has recently been introduced. 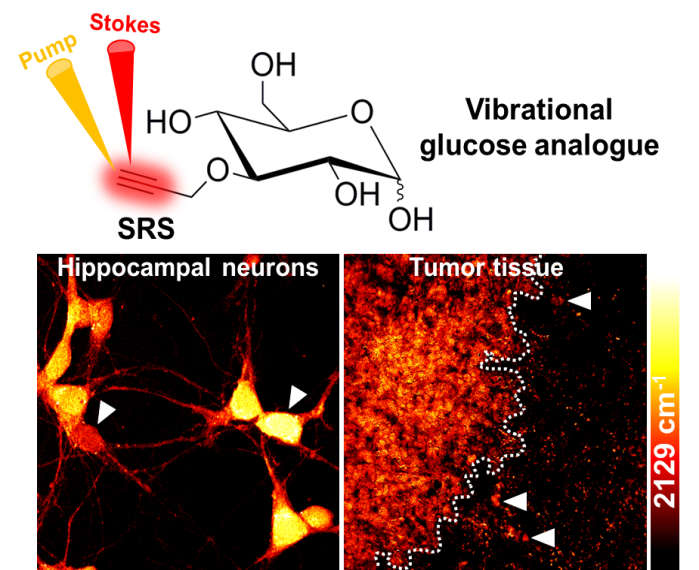 By coupling SRS microscopy with tiny and Raman-active vibrational probes (e.g., alkynes and stable isotopes), bioorthogonal chemical imaging exhibits superb sensitivity, specificity, and biocompatibility for imaging small biomolecules in live systems. 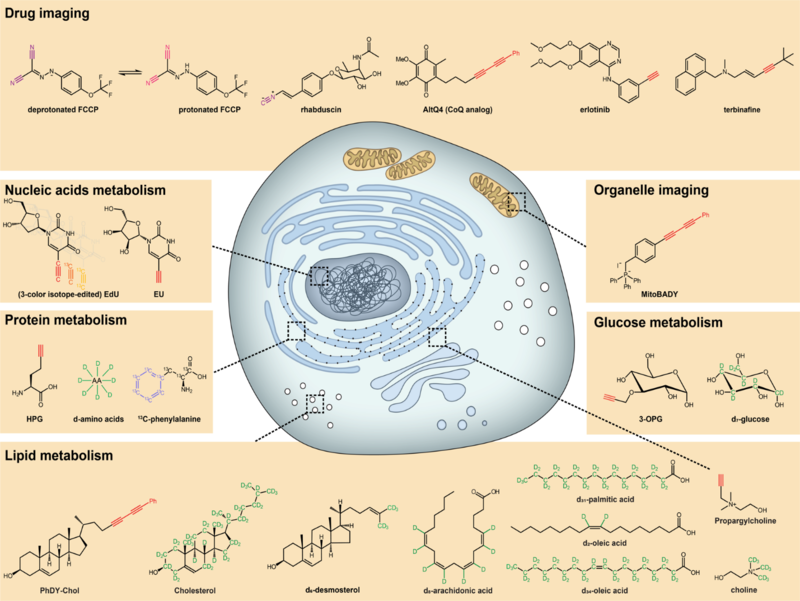 A broad spectrum of small biomolecules, including ribonucleosides and deoxyribonucleosides, amino acids, fatty acids, choline, glucose, cholesterol, and small-molecule drugs can be imaged in live biological systems ranging from individual cells to animal tissues and model organisms. Importantly, this platform is compatible with live-cell biology, thus allowing real-time imaging of small-molecule dynamics. Moreover, further chemical and spectroscopic strategies are developed for multicolor bioorthogonal chemical imaging, a valuable technique in the era of “omics”. L. Wei, F. Hu, Z. Chen, Y. Shen, L. Zhang and W. Min. “Live-cell bioorthogonal chemical imaging: stimulated Raman scattering microscopy of vibrational tags”, Acc. Chem. Res. 49, 1494 (2016). L. Wei, F. Hu, Y. Shen, Z. Chen, Y. Yu, C. Lin, M. Wang and W. Min. 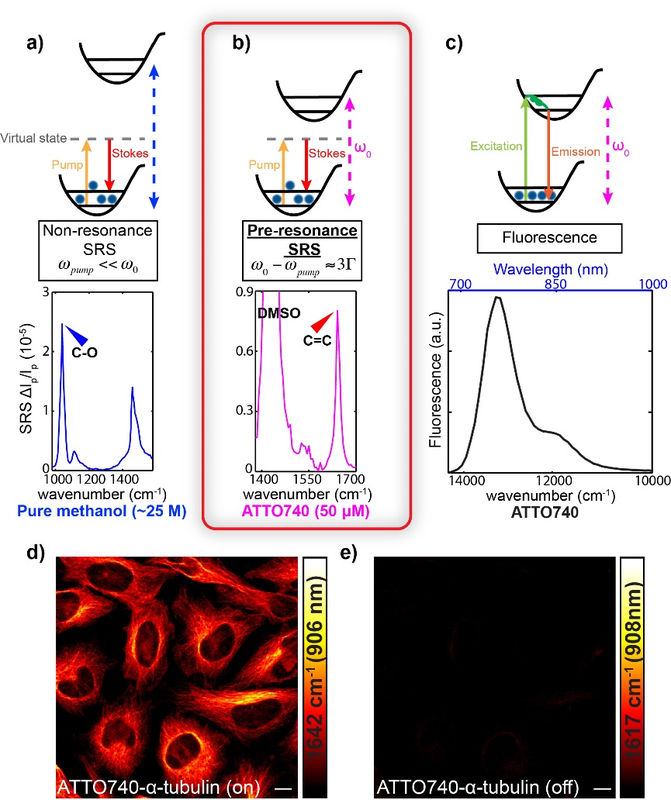 “Live-cell imaging with alkyne-tagged small biomolecules by stimulated Raman Scattering”, Nature Methods, 11, 410 (2014). Z. Chen, V. C. Cornish* and W. Min*. “Chemical tags: inspiration for advanced imaging techniques”, Curr. Opin. Chem. Biol. 17, 637 (2013). Z. Zhao, Y. Shen, F. Hu and W. Min. “Applications of vibrational tags in biological imaging by Raman microscopy”, Analyst, 142, 4018 (2017). F. Hu, S. D. Brucks, T. Lambert, L. Campos and W. Min. Stimulated Raman scattering of polymer nanoparticles for multiplexed live-cell imaging. Chem. Commun., 53, 6187 (2017). Z. Chen, D. Paley, L. Wei, A. Weisman, R. Friesner, C. Nuckolls* and W. Min*. 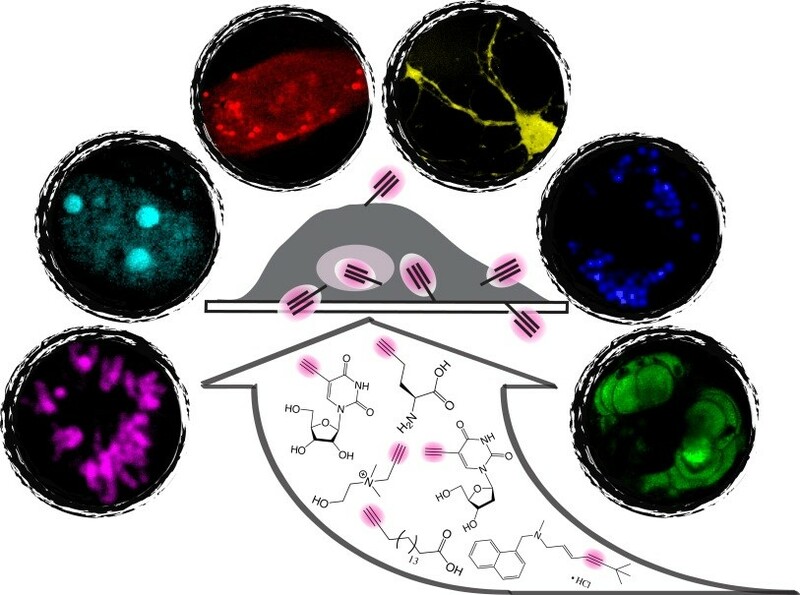 “Multicolor live-cell chemical imaging by isotopically edited alkyne vibrational palette”, J. Am. Chem. Soc. 136, 8027 (2014). We synthesized a novel super-multiplexed palette of Raman probes, by engineering conjugated poly-ynes (also called carbon-atom wires). Compared to other carbon materials such as graphene and carbon nanotube, carbon-atom wire is one of the least studied carbon allotropes with 1-D structure. We realized and harnessed the optical tunability of these wires. By meticulously engineering of the conjugation length, isotope doping and end-capping substitutions, we synthesized a library of wires with distinct Raman frequencies. 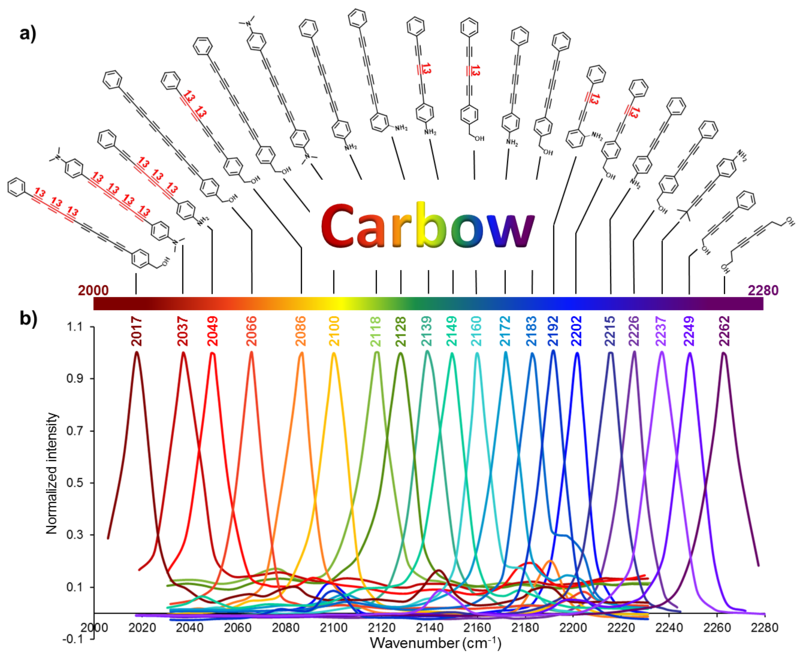 20 of them are termed as Carbon rainbow (i.e., Carbow). F. Hu, C. Zeng, R. Long, Y. Miao, L. Wei, Q. Xu and W. Min. Super-multiplexed optical imaging and barcoding with engineered polyynes. Nature Methods (2018) in press. 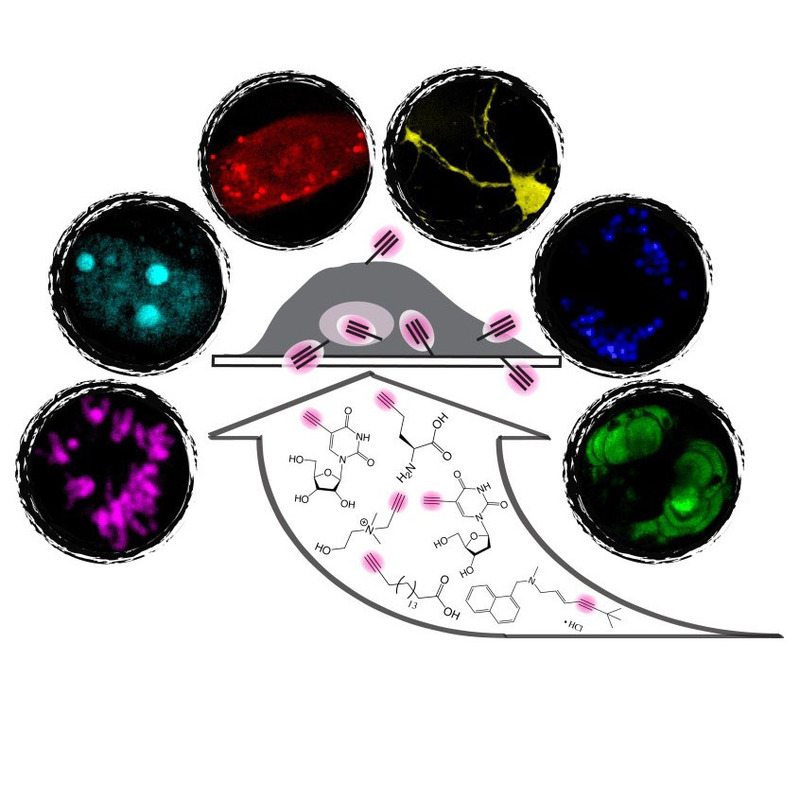 Our group is interested in applying SRS microscopy and bioorthogonal chemical imaging to study complex cell metabolism in a wide variety of cells, tissues and organisms in vivo. Lipids are a broad class of vital biomolecules. Together they play indispensable roles in energy storage, membrane architecture and cell signaling. However, elevated lipid concentration can pose detrimental effects leading to cell death. Such aberrant lipid biology is quite general, and contributes to metabolic disorders such as obesity and diabetes, as it has been well documented in a wide spectrum of cells and tissues. Importantly, saturated fatty acids (SFAs), but not unsaturated fatty acids (UFAs), can elicit the lipotoxicity. Mysteriously, UFAs even reverse the impairments of SFAs. Despite extensive researches into the underlying biochemical mechanisms, the biophysical basis of this aberrant lipid metabolism is largely unknown. For instance, people actually don’t know what subcellular compartments fatty acid metabolites build up in, what the structural, dynamical and functional natures of SFA-derived metabolites are, and how SFAs and UFAs are different. Using SRS microcopy to track the intracellular fates of deuterium-labeled lipids, we have identified previously unknown structure, dynamics and function of lipid metabolites. Surprisingly, metabolites of SFAs are found to phase segregate the endoplasmic reticulum (ER) membrane (which presumably adopts a uniform phase) in a wide range of cell types. Remarkably, the newly formed domains exhibited solid-phase membrane characteristics as detergent resistance, high conformational order, ultraslow lateral diffusion, strong intra-domain interaction and large-scale structural stability. The is the first report of solid-phase membrane in living mammalian cells to our best knowledge. We further found that adding unsaturated fatty acids could ‘melt’ the membrane islands frozen by saturated fatty acids. This new mechanism can partly explain the beneficial effect of unsaturated fatty acids and how unsaturated fats like those from fish oil can be protective in some lipid disorders. Y. Shen, Z. Zhao, L. Zhang, L. Shi, S. Shahriar, R. B. Chan, G. Paolo and W. Min. “Metabolic activity induces membrane phase separation in endoplasmic reticulum”, Proc. Natl. Acad. Sci. USA 114, 13394 (2017). Protein metabolism, consisting of both synthesis and degradation, is highly complex, playing an indispensable regulatory role throughout physiological and pathological processes. Over recent decades, extensive efforts, using approaches such as autoradiography, mass spectrometry, and fluorescence microscopy, have been devoted to the study of protein metabolism. However, noninvasive and global visualization of protein metabolism has proven to be highly challenging, especially in live systems. We have harnessed SRS imaging coupled with deuterated amino acids for live visualization of complex protein metabolism, including synthesis, degradation, and pulse–chase analysis of two temporally defined populations. We are studying protein synthesis and degradation and trafficking in brain tissues, zebrafish, and even mice in vivo. L. Wei, Y. Shen, F. Xu, F. Hu, J. Harrington, K. Targoff and W. Min. 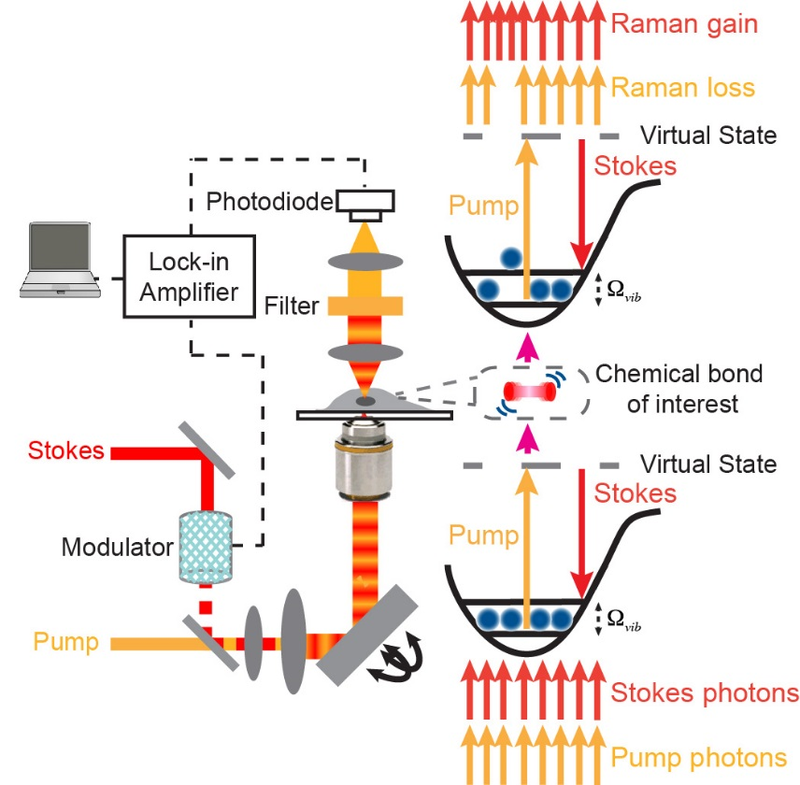 “Imaging complex protein metabolism in live organisms by stimulated Raman scattering microscopy with isotope labeling”, ACS Chem. Biol. 10, 901 (2015). L. Wei, Y. Yu, Y. Shen, W. C. Wang* and W. Min*. “Vibrational imaging of newly synthesized proteins in live cells by stimulated Raman scattering microscopy”, Proc. Natl. Acad. Sci. USA 110, 11226 (2013). Y. Shen, F. Xu, L. Wei, F. Hu and W. Min. “Live-cell quantitative imaging of proteome degradation by stimulated Raman scattering”, Angew. Chem. Int. Ed. 53, 5596 (2014). Glucose is a ubiquitous energy source for most living organisms. Its uptake activity closely reflects cellular metabolic demand in various physiopathological conditions. Extensive efforts have been made to specifically image glucose uptake, such as with positron emission tomography, magnetic resonance imaging, and fluorescence microscopy, but all have limitations. To visualize glucose uptake activity in live cells and tissues, we are performing SRS imaging on a novel glucose analogue labeled with a small alkyne moiety. Cancer cells with differing metabolic activities can be distinguished. Heterogeneous uptake patterns are observed with clear cell–cell variations in tumor xenograft tissues, neuronal culture, and mouse brain tissues. By offering the distinct advantage of optical resolution but without the undesirable influence of fluorophores, this method will facilitate the study of energy demands of living systems with subcellular resolution. R. Long, L. Zhang, L. Shi, Y. Shen, F. Hu, C. Zeng and W. Min. Two-color Vibrational Imaging of Glucose Metabolism by Stimulated Raman Scattering. Chem. Commun. 54, 152 (2018). F. Hu, Z. Chen, L. Zhang, Y. Shen, L. Wei and W. Min. “Vibrational imaging of glucose uptake activity in live cells and tissues by stimulated Raman scattering”, Angew. Chem. Int. Ed. 54, 9821 (2015). Tumor metabolism supports the abnormal survival and growth of malignant cells by providing energy, biomolecular precursors, and reducing equivalents. It is regulated by a combination of cell-intrinsic and cell-extrinsic factors. Upregulated syntheses of new biomolecules in cancer cells are the hallmark biological characteristic in tumor. However, current techniques such as MRI and PET have limited spatial resolution to observe caner metabolism and its heterogeneity at subcellular resolution. To demystify the new synthesized biomolecules’ spatial distribution inside tumor, we applied bioorthogonal chemical imaging to visualize newly synthesized biomolecules in tumors after in vivo delivery of alkyne or isotope labeled metabolites into tumor-bearing mice. This method opens a door to study tumor metabolic heterogeneity and to observe metabolic competition or cooperativity among stromal, immune, and tumor cells with subcellular resolution. L. Zhang and W. Min. Bioorthogonal chemical imaging of metabolic changes during epithelial–mesenchymal transition of cancer cells by stimulated Raman scattering microscopy. J. Biomed. Opt. 22, 106010 (2017). Brain is an immensely complex system displaying dynamic and heterogeneous metabolic activities. Visualizing cellular metabolism of nucleic acids, proteins, and lipids in brain with chemical specificity has been a long-standing challenge. Recent development in metabolic labeling of small biomolecules allows the study of these metabolisms at the global level. 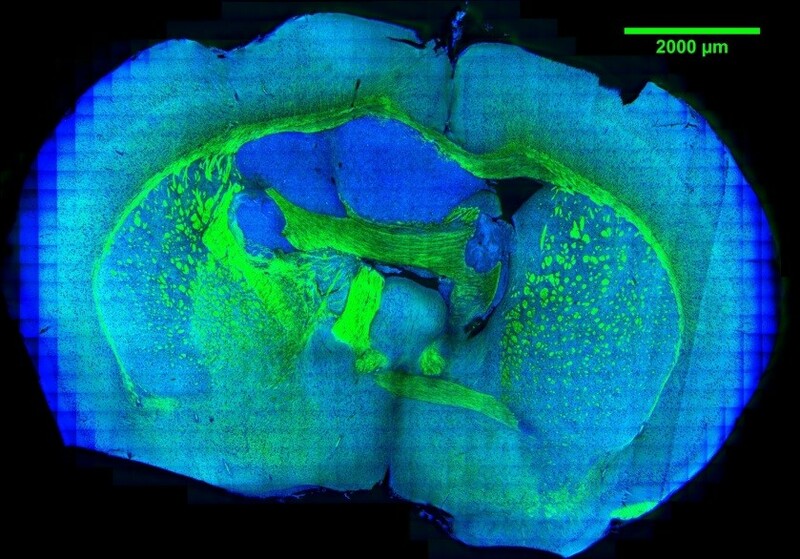 However, these techniques generally require nonphysiological sample preparation for either destructive mass spectrometry imaging or secondary labeling with relatively bulky fluorescent labels. We work on bioorthogonal chemical imaging of DNA, RNA, protein and lipid metabolism in live rat brain hippocampal tissues by coupling SRS microscopy with integrated deuterium and alkyne labeling. Heterogeneous metabolic incorporations for different molecular species and neurogenesis with newly-incorporated DNA were observed in the dentate gyrus of hippocampus at the single cell level. We further applied this platform to study metabolic responses to traumatic brain injury in hippocampal slice cultures, and observed marked upregulation of protein and lipid metabolism particularly in the hilus region of the hippocampus within days of mechanical injury. Thus, our method paves the way for the study of complex metabolic profiles in live brain tissue under both physiological and pathological conditions with single-cell resolution and minimal perturbation. We are currently working on imaging brain metabolism in vivo. F. Hu, M.R. Lamprecht, L. Wei, B. Morrison III and W. Min. “Bioorthogonal chemical imaging of metabolic activities in live mammalian hippocampal tissues with stimulated Raman scattering”, Scientific Report, 6, 39660 (2016). With the good specificity, sensitivity, photo-stability and live-cell compatibility, we combined five organelle-targeted Carbow-based Raman probes and five fluorescent reporters to achieve tandem 10-color optical imaging of subcellular structures in live cells (including plasma membrane, ER, Golgi, mitochondria, lysosome, lipid droplets, nucleus, tubulin and actin). Here the unprecedented 10-color organelle imaging in live cells doesn’t require any unmixing or color compensation in image processing, which is extremely difficult to achieve by other means. To our knowledge, this is the highest number demonstrated for multi-target imaging inside living cells, and relies critically on Carbow’s well-resolved frequencies and outstanding live-cell compatibility. Systems biology and personalized medicine demand high-throughput analysis of cells and biomolecules such as antigens and drugs, the core technology of which often requires distinguishable barcoding. We hence applied Carbow to optical data storage and identification on microbeads. 10 resolvable frequencies at 3 distinct intensity levels (i.e., ternary digit) readily renders 310-1=59048 distinct barcodes, yielding the largest number of distinct spectral barcodes to date, whereas the literature record is around 1000. 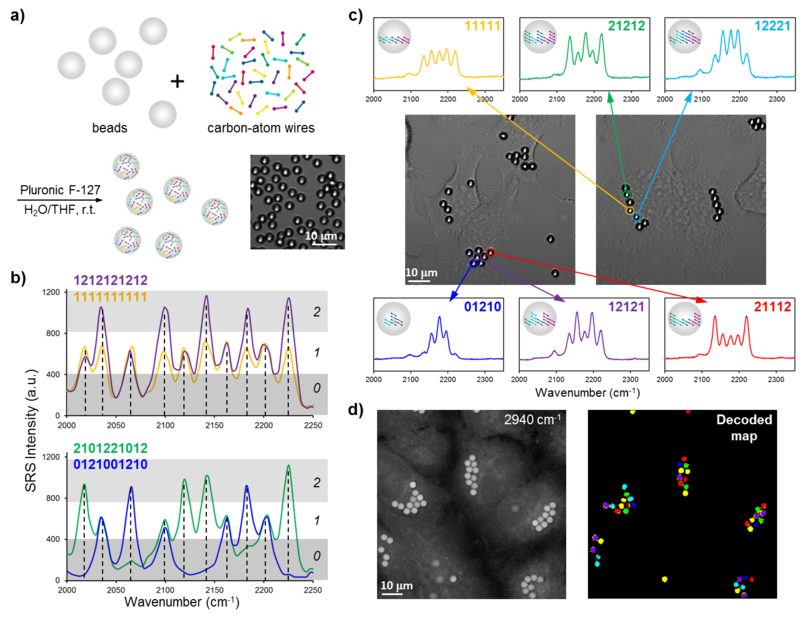 Besides in vitro detection, barcoded beads can potentially be used as a unique ID to tag individual cell and map out the interaction of cells with time, as in the human cell atlas project (studying ~ 1013 cells). Owing to the small micron-size, multiple beads can be combined in labeling single cell. We show that HeLa cells can take up several beads containing different barcodes. 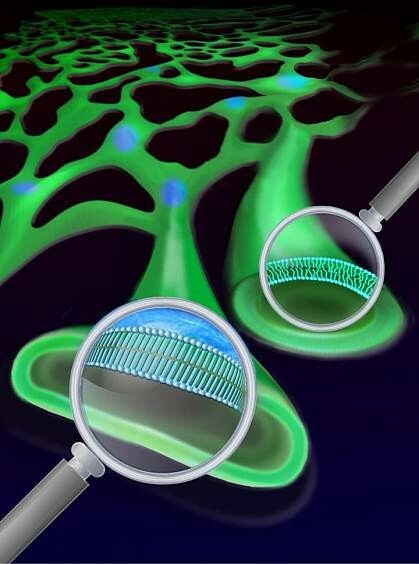 The encoded information can be read out by Raman spectroscopy, allowing rapid visualization of cell identity. Hence, if using 3 encoded beads to tag each cell, we would be able to generate 59048C3=3×1013 IDs, sufficient to identify all cells in the human body.